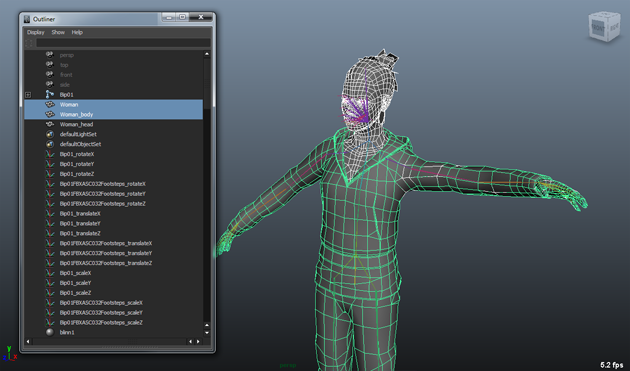 When dealing with existing characters, it may be useful to split an existing mesh in parts. the other for the body (Woman_body). 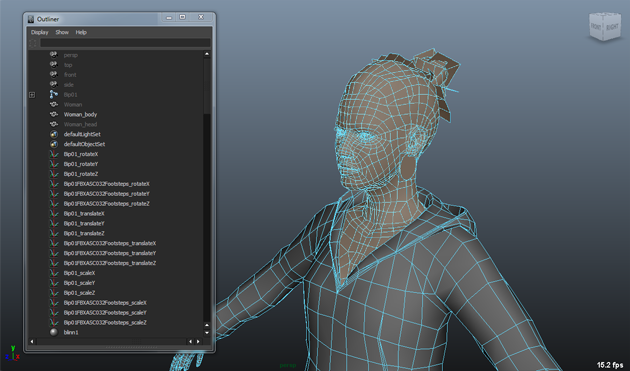 1) Duplicate (Ctrl+D) your character geometry twice. 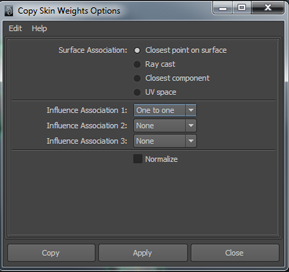 By using the regular Duplicate Tool, the skinning is lost on the copied geometry. Rename your geometries to Woman_head and Woman_body. 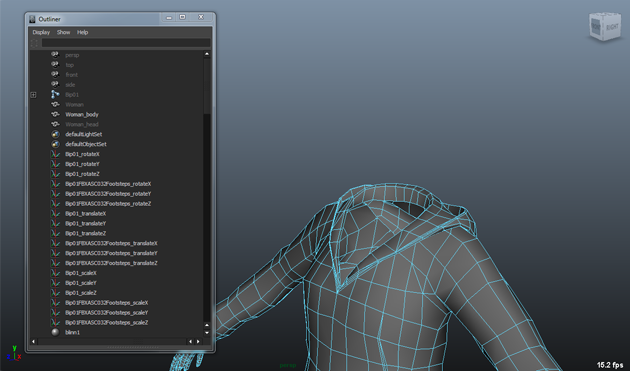 3) Now, we've got two complementary meshes. Let’s apply the skinning. 4) First, we need to specify that the two meshes (Woman_Head & Woman_Body) are skin cluster. 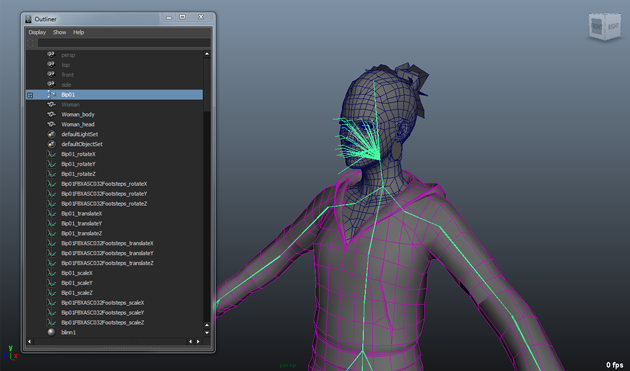 First select your skeleton hierarchy root joint , then select Woman_Body and go to the Animation Menu ⇒ Skin ⇒ Bind Skin ⇒ Smooth Bind. When selecting the skeleton root, your mesh now appears in pink. Proceed the same way with Woman_Head. 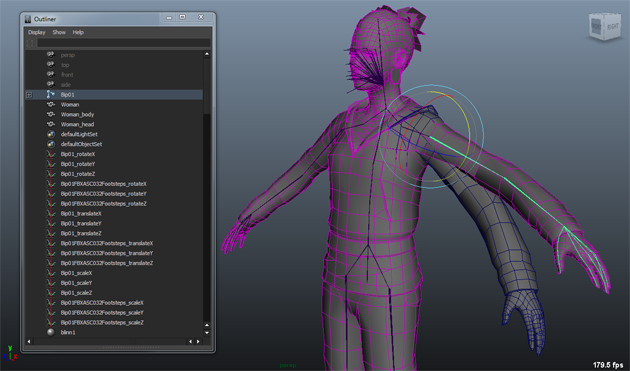 5) Last step but not least, apply the exact skinning weight we had on our original geometry. First select the hidden mesh Woman, then select Woman_Body and go to the Animation Menu ⇒ Skin ⇒ Edit Smooth Skin ⇒ Copy Skin Weights Advanced Menu ⇒ Chose the following options. Proceed the same way with with Woman_Head. 6) Just check that your new meshes behave the same way than the original one (joint orientation, scale…), and you’re done!